I have heard several instances where people have graciously sent a get well card to a friend in the hospital – and it not getting there. For what ever reason, it seems as though cards are something that don’t always get forwarded to the patient in a hospital setting. Well, University of Pittsburgh Medical Center ( UPMC ) has a neat way to get this done effectively. It is easy and FREE. So if you are pressed for time or want to try something different to bless a friend or family member, check out the free card site from UPMC. Send a Free card today! You can save up to an average of a third of your gas use if you have a gas oven or range with an automatic (electronic) ignition system rather than a unit with an open flame pilot light. When boiling water, cover the pot, you will heat the water faster and save energy. When using your stovetop make sure the pan size matches the heating element size. This will prevent loosing heat if the pot is too small for the burner. Pre-heating your oven generally wastes energy and money, so unless required consider skipping the pre-heat. If you have an extra freezer in the basement, make sure you keep it full if it is running. It costs more to keep air cold than to keep the contents. Check the condenser coils on your appliance a couple of times a year and make sure they are clean. Appliance with dirty coils generally consume more energy. Keep an eye on your door seals of your refrigerator and freezer. If the seal is not working properly and air is escaping, you may want to repair or replace. Before you store leftovers in the refrigerator or freezer, let them cool down. This will prevent your refrigerator from having to cool them down. Always cover foods, even more so liquids, prior to storing them in the refrigerator; sometimes moisture can enter the refrigerator and cause the refrigerator to work harder and use more energy. Remember, these tips are only general guidelines. Every situation is different, so contact a professional for specific questions. If you have a tip to share, you are welcome to submit a post. Have a great day! There are many people that try to sell their own home themselves, but many are not successful. About 80 percent of “For Sale By Owners” end up selling with an Real Estate Professional, believe it or not. Marketing and other chores can be a burden. Seller’s often are not sure how to price their home.Â Selling Real Estate is a full time job.Â An important aspect to consider when hiring an agent is always ask if an agent is full time in the real estate business. A good number of agents are not. The agents who are not full time quite often have other jobs. They are not there for you to answer questions and give you the high quality service. Another interesting thing is that statistics show that you will, on average, receive 16% more for your home using a Real Estate Professional. Wow! That is great! Even though you pay a fee for these services you will be coming out with more money in your pocket. Not bad – and you don’t have to do any of the work except for having your house ready to show. Sounds like a good deal to me. One of the top complaints that I have heard from sellers that have tried selling their own home is that they had a buyer but the financing fell through. One thing a Real Estate professional does is pre-approve buyers. This helps from wasting your valuable time. I don’t know about you, but I would not want to let just anyone in my house to show them my home – consider security.Â Just something to think about. Five years ago, when I moved into the current home I am living in now, a gracious neighbor brought me a plant. 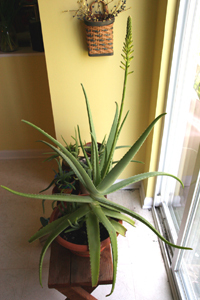 It was an extremely large and healthy aloe plant. Most of my previous plant experience was with aloe’s. So I thought this was great. I really never had too many other kinds. These plants are very hardy as per my experience. I don’t alway remember to water them on a timely basis but some how they keep hanging on. Well, to my surprise this plant (now even larger), sprouted a very interesting branch. Funny thing is I did not notice right away. Out came a bud on this stalk. It has been going for a few weeks now and may blossom any day now. I went and did some research and found that there are about 400 kinds of aloe plants (who knew? – may you did – I didn’t). I am really excited to see what color the buds bloom into. I love taking photos of all kinds. The ultimate thing is to be in the right place at the right time with your camera. This photo is something I can never imagine being able to take. Lucky photographer. It is very important to stage a home right to help sell it. One of the most important things is the front. If someone does not like the front, it is very difficult to get them to go inside, even thought the inside may be beautiful. Your front door is the first thing the buyers see – give it some fresh paint and make it shine! Consider your clutter piles. You know when there is a clutter pile in a certain area of the house, sometimes I tend to block it out if I get busy. If it is not too big, I can forget it is there. I would be the first one to notice though I did not live there and were walking in. You need to consider what other people would see. Would you want to buy the house if you were walking in for the first time? Some times you can also get used to a smell if you have one in your home. Another thing to do is if you cannot find a place for items that are making the place seem small, get a storage unit. Hopefully it will be for the short term. Believe me, it will make all the difference. Here is a site with some great staging tips. Even though the market in the Pittsburgh area fairs well compared to most parts of the country, there are still foreclosures in the area. Many investors want to scoop them up for a real deal and build their inventory of rental properties. Keep in mind to do your research. Many times properties are sold as is ( even the copper pipes can be missing as with some of I have seen in recent weeks). The banks often want the buyer to pay for any required inspections by local ordinances ( ie such as dye tests and occupancy permits ) as well both sides of the property transfer tax. Banks are not typically going give these properties away but need to cover as much of the cost as possible. Many times they loose more than what is owed. If you were to buy a foreclosed property for your own occupancy, the best scenario to bring to the bank is cash. A cash buyer will usually win if there are multiple offers. If you have a house to sell, the bank will typically not be interested in an offer. These homes need to be closed on quickly. I could not believe my ears on this Sunday morning at 7:20 am. The red bellied woodpecker was back and banging on the house. I went to open the window and he left. Then about 40 minutes later, he was back again tapping on the house. The funny thing is when he taps on the gutter it echoes through the whole back of the house like he is right there. My son was not too happy with him either. He must like quiet weekend mornings. I opened the window again and saw him fly to the nearest tree.